down beside a tundra buggy in Churchill. We were up and about by 6:30am this morning and having breakfast by 6:45am .... it was Tundra Buggy day!! Usually the buses which collect passengers for the tundra buggy excursions arrive between 7:30 - 8:00 am and transport them out to the Churchill Wildlife Management Area which is the departure point for the tours. We'd arranged to drive ourselves out because if we get back from the tour early enough there'd be a chance to check out our usual circuit before heading for home. We were out at the buggy terminal by 8:15am as promised and were directed to the tundra buggy where we awaited the rest of the passengers and driver. It was toasty warm in the buggy since there was a gas fireplace on board which had obviously been lit sometime earlier. Once onboard we claimed our seats, then about 10 minutes later the bus load arrived and the tundra buggy was full of excited passengers. Our driver introduced himself then had each passenger sign a waiver form and go through the safety procedures as well as the dos and don'ts while onboard. By 9:00am we were pulling away from the platform sitting firmly in our seats. As well as the gas fireplace, the tundra buggy is equipped with a washroom, a necessary facility since the tour is around 8 hours long and there is no getting off the buggy once you're on. The tundra buggies travel along roads which were once used by the Canadian and American military but are now public - rough as they are. We started the journey by bumping off down one of the roads. One particularly nasty piece of road had one poor soul being flung from his seat and dumped on the floor of the buggy. He was aided by some fellow passengers back to his seat where he remained for the rest of the trip - he held on tight from that moment! Our first sighting of a polar bear was about a half hour into the tour. A large lone male pacing the icy fringes of Hudson Bay. It was very far off in the distance but our fellow passengers were very excited and proceeded immediately to the open deck at the rear of the vehicle as well as opening all the side windows. After 5 minutes things had calmed down (and cooled down) and people returned to their seats, so we were able to continue along the bumpy road again. Catching up with several other buggies who'd been ahead of us, we saw that they were watching another large polar bear somewhat closer (but still far away) than the last one who was wandering through the thickets. It sure was nice to see the bears doing more than just sleeping through the day! A few minutes later we saw a young woodland caribou. The youngster had apparently been separated from its herd which had moved farther south. Our driver explained an encounter he'd observed between this caribou and a polar bear mum with single cub. At first the caribou had frightened the bears and they'd ran off in a blind panic, until they realised it didn't pose any threat to them. Then they returned to the caribou who then ran from them. Luckily for the caribou the bears must've figured they'd need to exert too much energy in order to catch it so left it alone. The caribou now wanders alone on the tundra amongst the world's largest land carnivore - the polar bear. We hope he lasts the winter to be reunited with his herd! By 11:00am we'd covered a lot of ground in the tundra buggy but had only seen two bears from a distance and were only about 20 to 30 minutes away from the Tundra Buggy Lodge, the farthest point on the tour. Then suddenly the show started to get interesting! We came across a cute little polar bear cub who was just hanging out with its mum. It was supposed to be sleeping but it was so curious it just had to come over and check out the buggy. This cutie would have been about 11 months old (born in December 2006). In December after a 3 month gestation period, the cubs are born in a den dug out by the sow. They weigh around 1kg at birth and are completely hairless, sightless, and helpless! By March/April, after nursing on their mothers rich milk and reaching a weight of around the 15kg, they are ready for the trek out onto the ice where their mothers begin to teach them the necessary hunting skills to survive. They are taught by preying on seal pups because they are easy prey. Our curious little cub checked out everyone on the buggy. 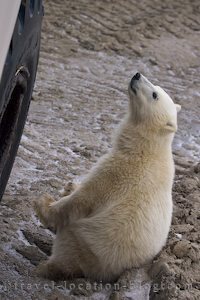 On his hind legs this 11 month old actually stands taller than the tundra buggy tyres (1.5 metres or 5 feet) which he leans on for a closer look. He is constantly under the watchful eye of his mother who was still resting nearby. After satisfying his curiousity with our buggy, the cub eventually wandered over to another buggy and proceeded to check out the chassis of the vehicle as though he was a mechanic. Since it was just after midday, our driver decided to serve lunch which consisted of beef and vegetable soup, and a sandwich to boot, rounded off with hot drinks. Almost as soon as the lid was popped off the top of the soup thermos the sow got up from where she was resting and wandered over to our buggy and was soon joined by her cub. The sow seemed very dispirited and low in energy, probably as a result of hunger, and for that reason the soup seemed more like a mean hearted tease than anything else. After a while the cub got bored and started playing around her neck - play biting, then patting her with his front paw, then sat himself down for a rest until his mother decided to move away. Our cute cub stayed put for about 3 minutes longer before getting up to follow her but got side tracked by a mouse which had him digging in the bushes. By the time he lost interest in the mouse his mum was far away, so he took off running to catch up. We continued on our way towards the lodge and found another large bear resting on the tidal flats at low tide. He was a little spooked at our arrival at first but settled back down to rest within minutes. That was pretty much all we could do with that bear, he wasn't moving anymore after that so we left him in peace and started heading back to the tundra buggy base. En-route back to the base, we came across a pure white arctic fox darting across the ice and foraging in the tundra. We spent about 20 minutes watching him as he jogged daintily on the ice sniffing at it constantly to pick up a scent. He seemed disinterested in the occupants of the tundra buggies and only gave them a few sideward glances. We arrived back at the base at around 4:30pm after following the same roads we took on the way out. We were both exhausted and the light was already beginning to dim so we just headed straight for our Bed and Breakfast and stayed in the rest of the night. 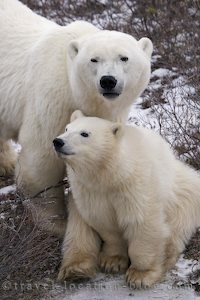 There are two operators of tundra buggy tours in Churchill namely Great White Bear Tours (CA$260.00 per person) and Tundra Buggy Adventure (CA$299.00 per person) - prices as of 2007. These prices are based on casual bookings for individuals who are not travelling with a group. Casual departures are irregular depending on what is available between the large group departures. If a buggy is available on a particular day, it will be used for casual bookings and usually all available seats are sold out very early - leaving virtually no chance of securing a seat on a tour once you've arrived in Churchill. Be sure to dress very warm with hats, gloves, layers of thermals and jackets. Although the tundra buggies are equipped with heaters, the hot air dissipates quickly when the windows and back door are opened for wildlife watching.